Di-Anodic Finishing Corporation can anodize aluminum products in clear and black up to 12 feet in length. Dyeing of other colors can be performed as well. Anodizing is a process that creates a protective layer of oxide on the surface of aluminum. This process uses a sulfuric acid bath as an electrolyte solution to facilitate the transfer of an electrical charge. A cathode or grounding pole is introduced into the electrolyte bath, while the aluminum product is given a positive charge allowing it to work as the positive pole or anode. 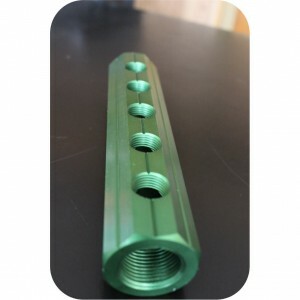 Once the anodized finish is complete, the dye can be introduced to add a variety of colors to your product. Di-Anodic Finishing Corp. performs Type II Sulfuric Acid Anodizing for both dyed and non-dyed products. The finished surfaces produced by Di-Anodic Finishing comply with MIL-A-8625 Type II Class 1 and Class 2 specifications.